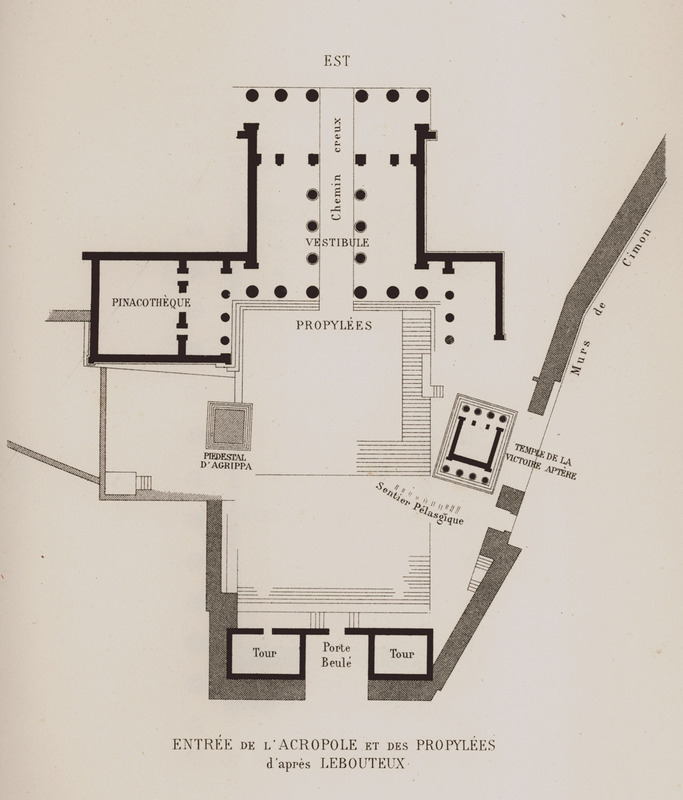 View and plan of the Propylaea of the Acropolis (reconstruction). 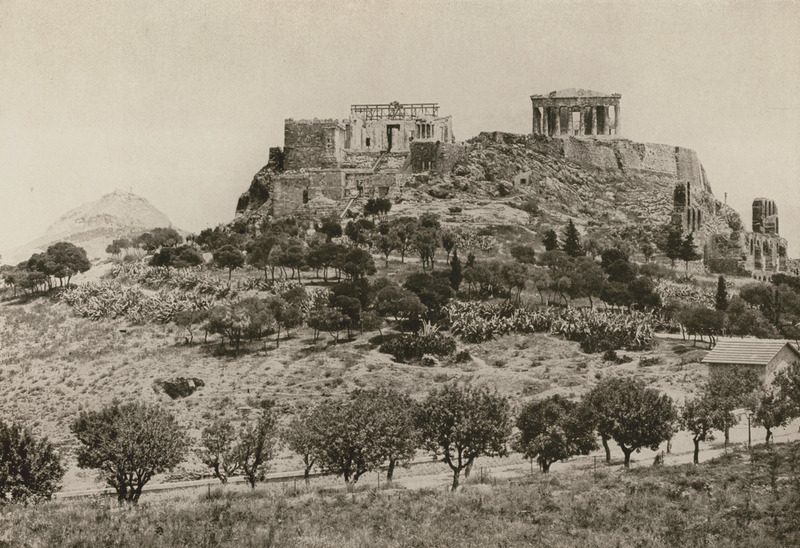 The Acropolis and Lycabettus hill from the west. 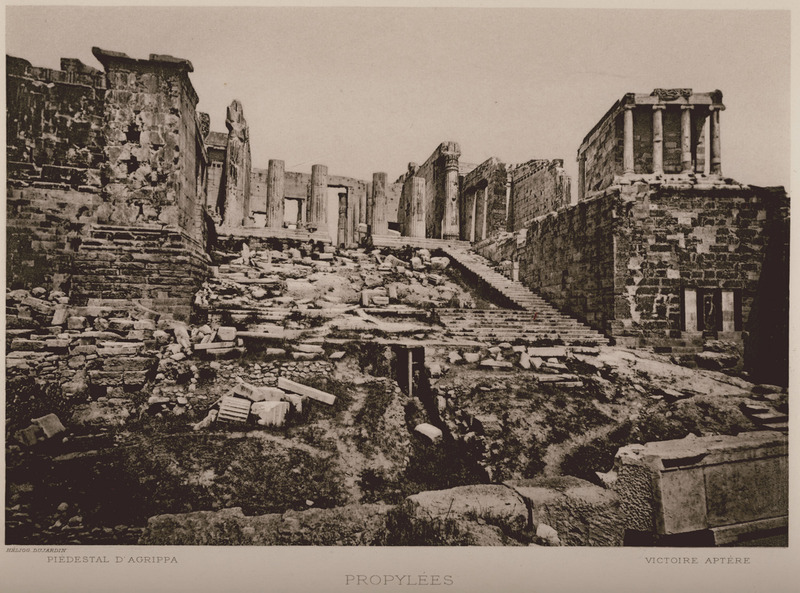 The Propylaea of the Acropolis. 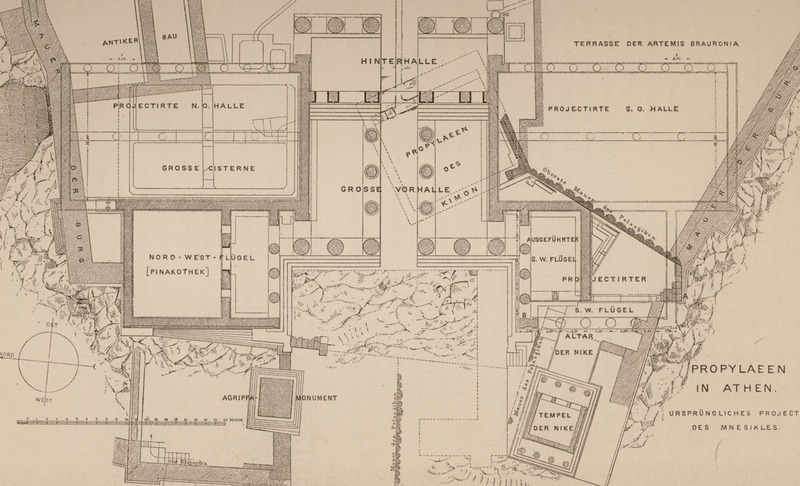 Mnesicles' initial plan for the Parthenon. Agrippa's monument. 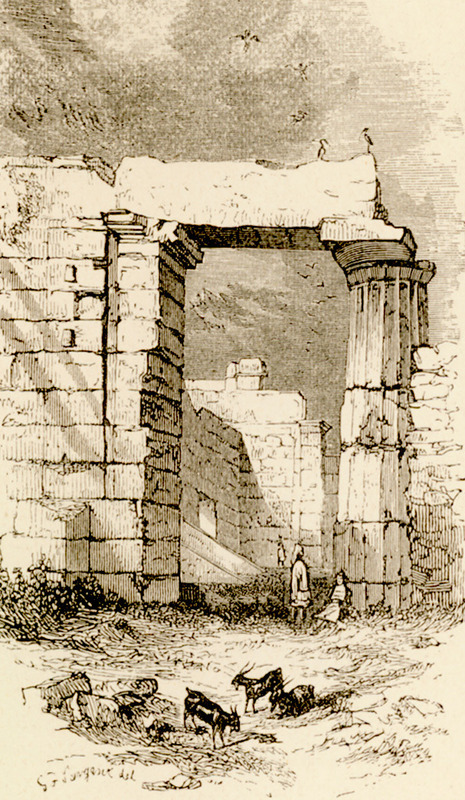 The ascent to the Propylaea. The Temple of Athena Nike. 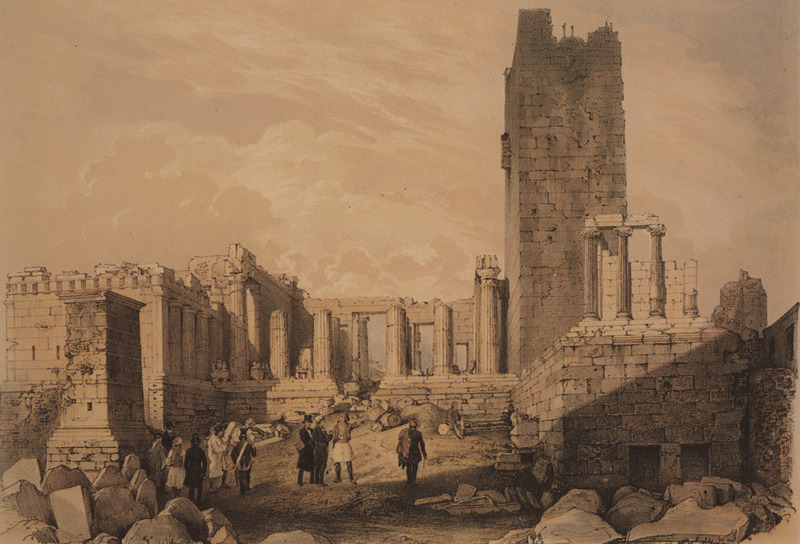 The Propylaea from the west. 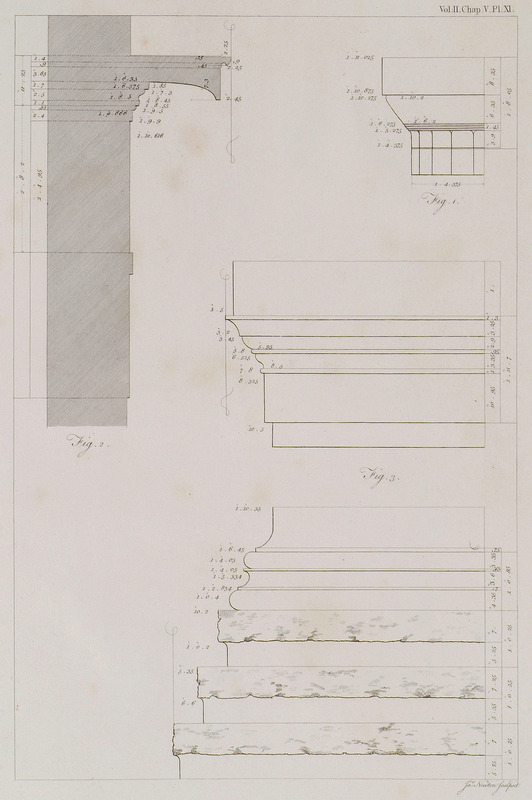 Section of the Propylaea according to Bohn. 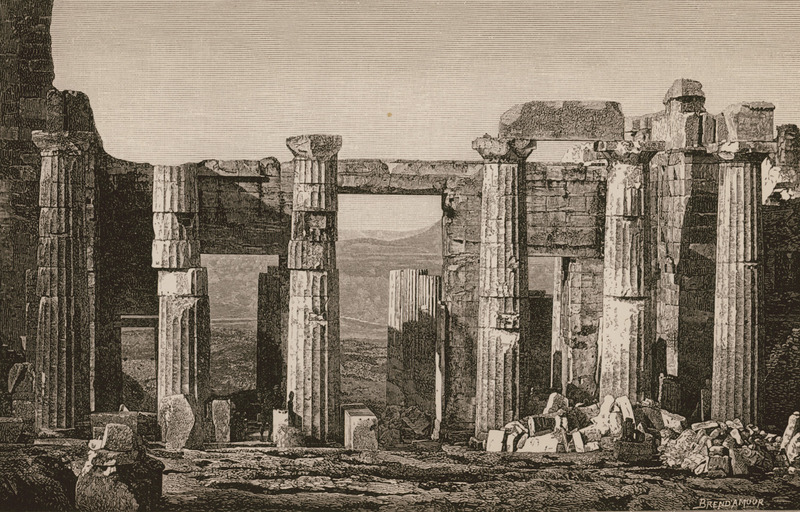 View of the Propylaea from the Pinacotheca of the Acropolis. 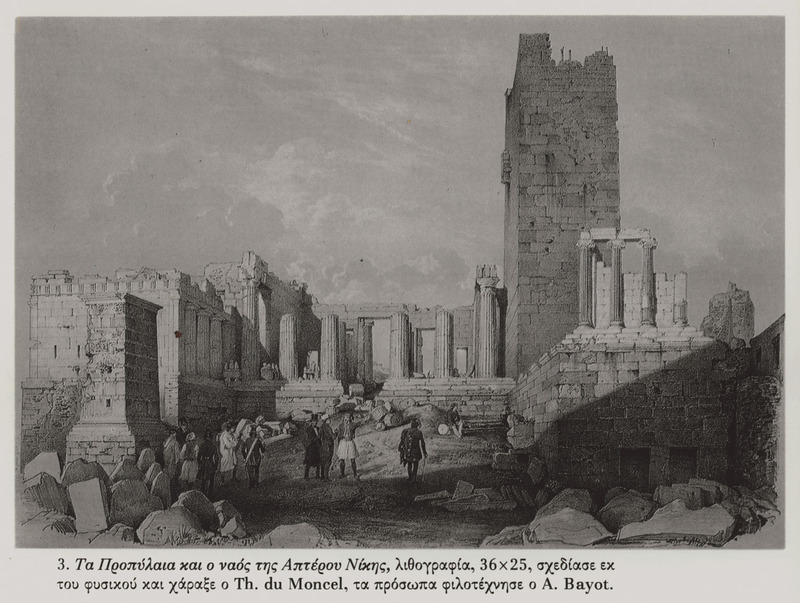 The Propylaea and the temple of Athena Nike. 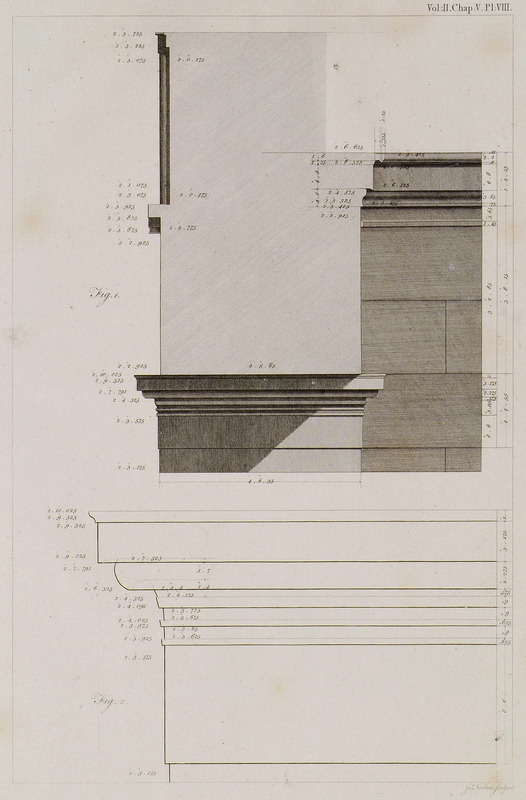 Frusta of the Propylaea columns. 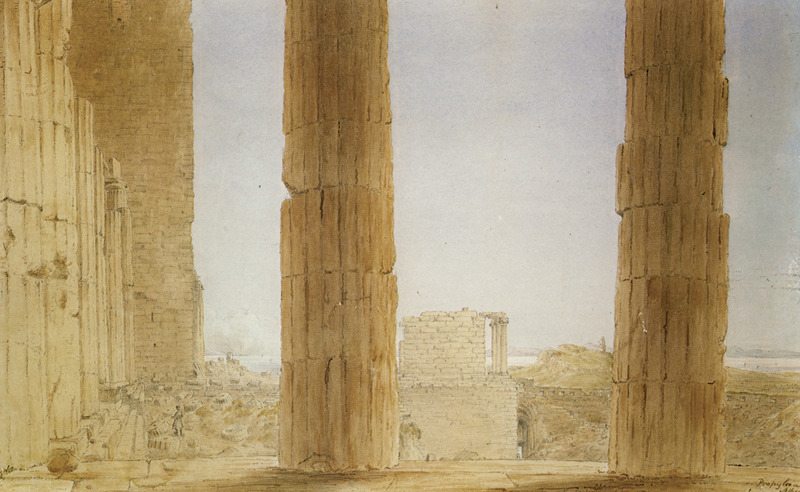 View of the Propylaea of the Acropolis from the Temple of Athena Nike. 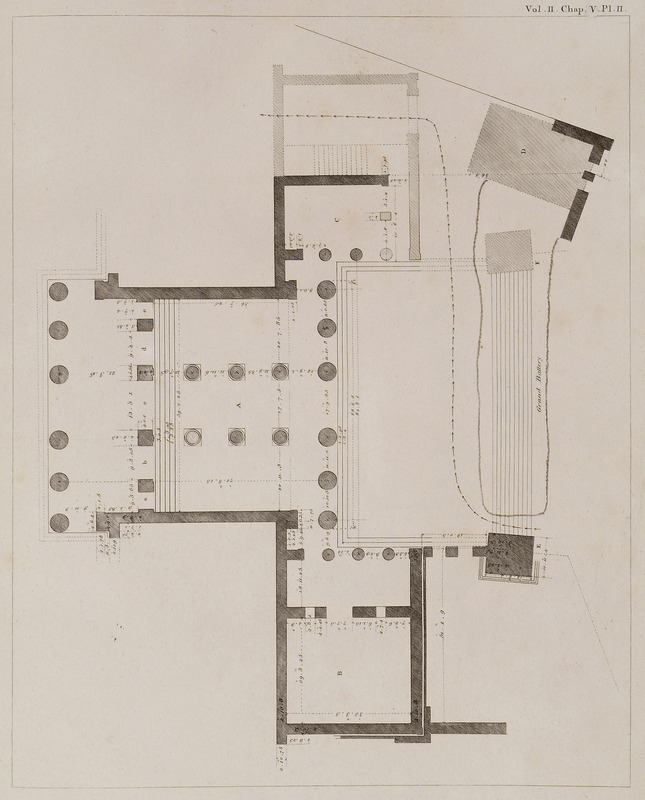 Plan of the Propylaea of the Acropolis. 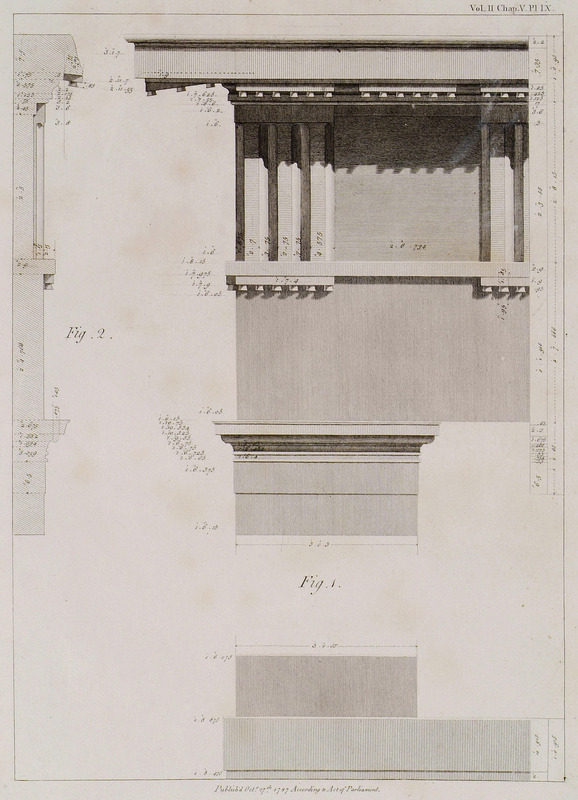 The elevation of the Propylaea. 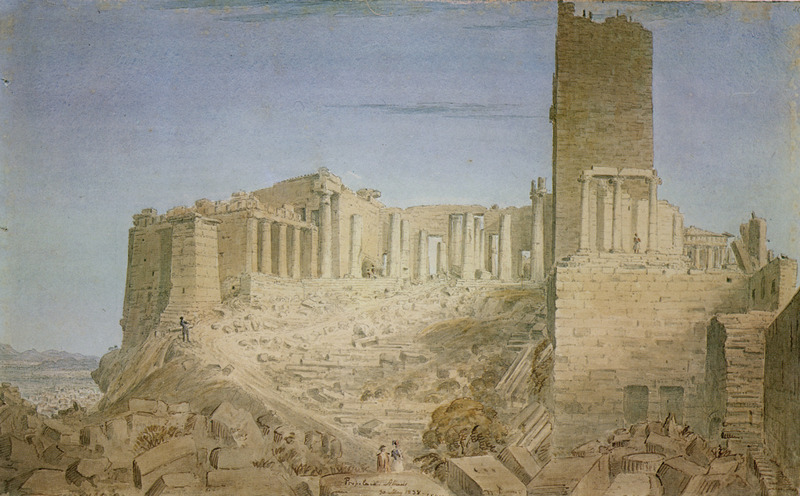 The Pinacotheca without wings; and the edifice formerly decorated with paintings. 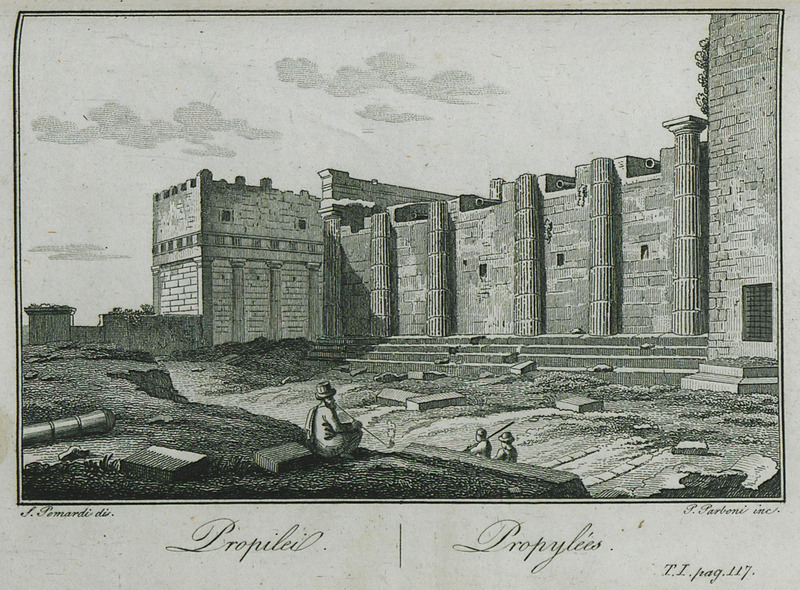 The section of the Propylae, and the pier on which an inscription in honor of M. Agrippa. 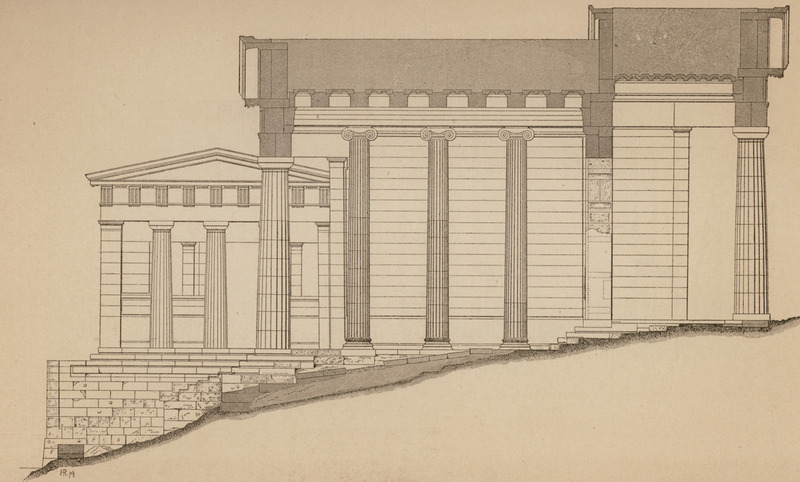 The flank of the Propylaea, with a transversal section of the Pinacotheca. 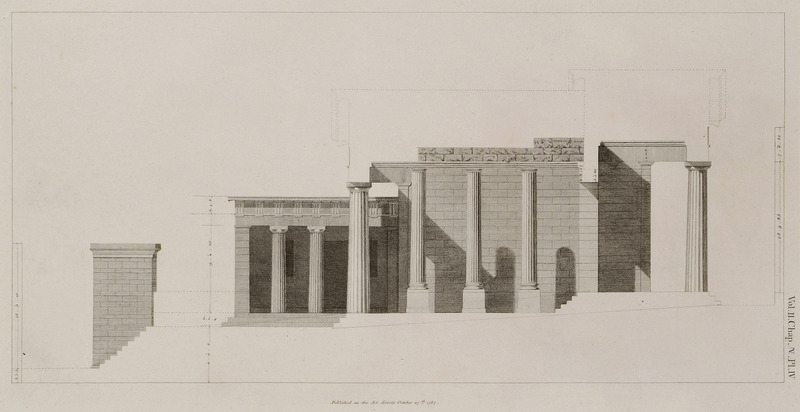 The Propylaea of the Acropolis of Athens: Fig. I. 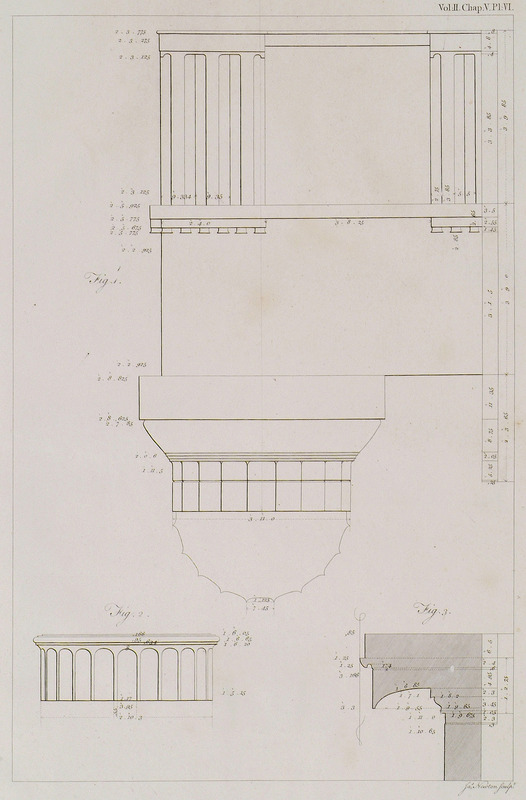 The capital, architrave, and frieze of the front columns. Fig. II. The upper part of the shaft of the Ionic columns. Fig. III. The external cornice on the north side of this building. 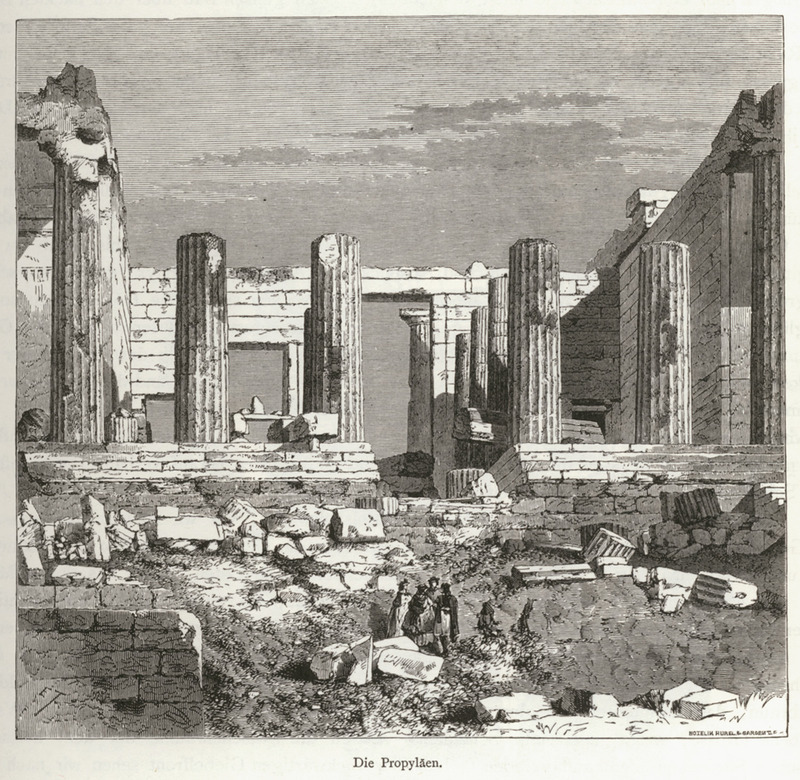 The Propylae of the Acropolis of Athens: Fig. I. The profile of the capital, on a larger scale. Fig. II. 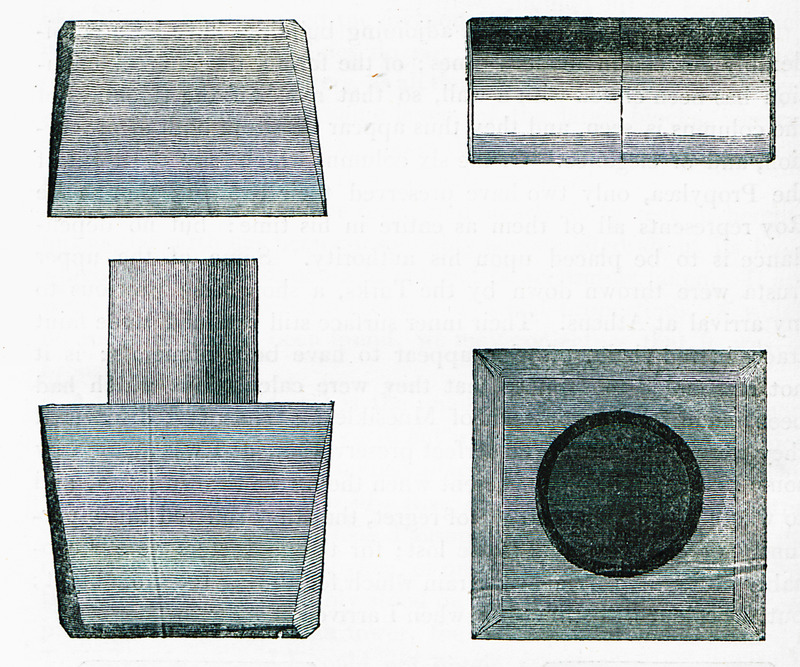 Section of the annulets and fluting, on a still larger scale. Fig. III. Section of the beams which supported the soffite. Fig. IV. 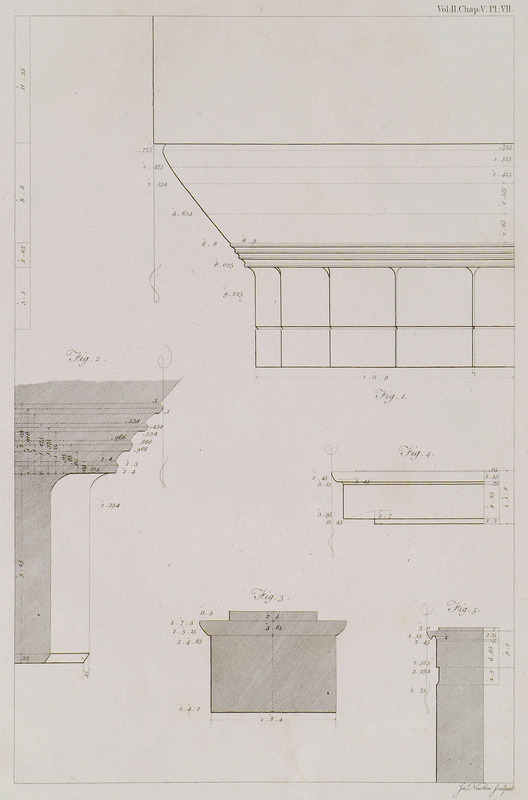 A piece of external cornice, which perhaps was on the south side. Fig. V. Cornice on the east side of the temple. 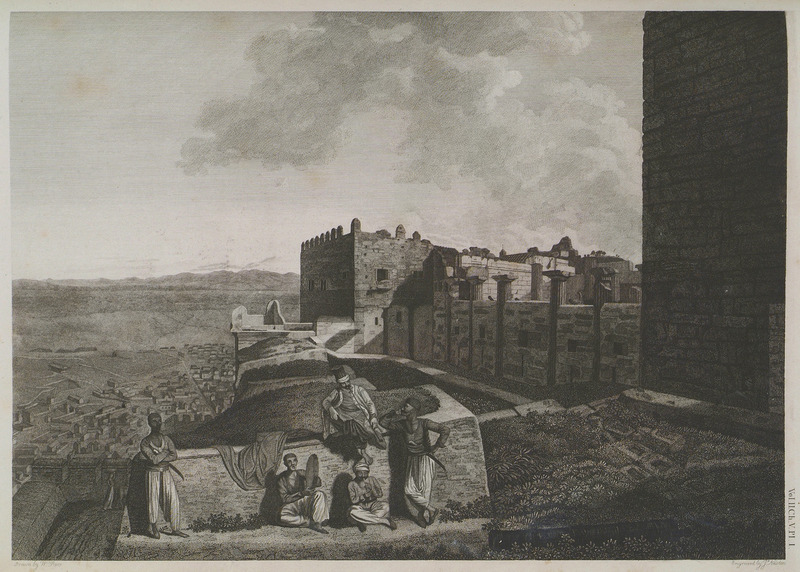 The Propylae of the Acropolis: Fig. I. 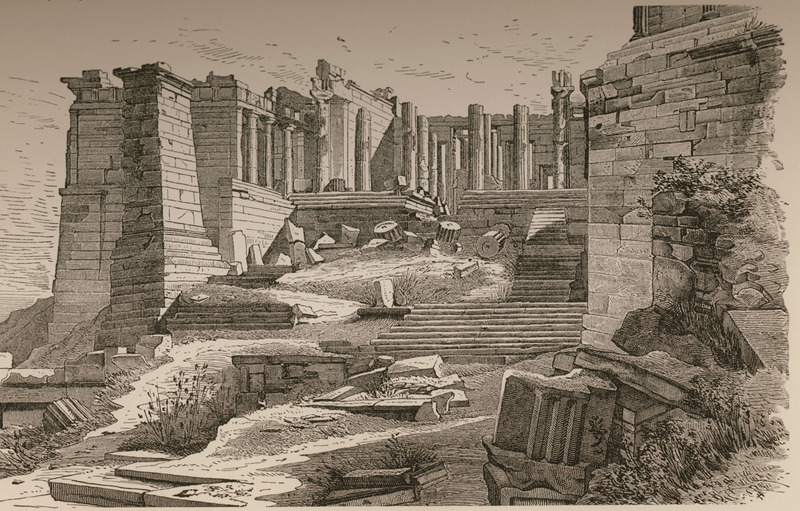 The capital of one of the antae, with a section of the architrave and frieze. Fig. II. The profile of the capital, on a larger scale. 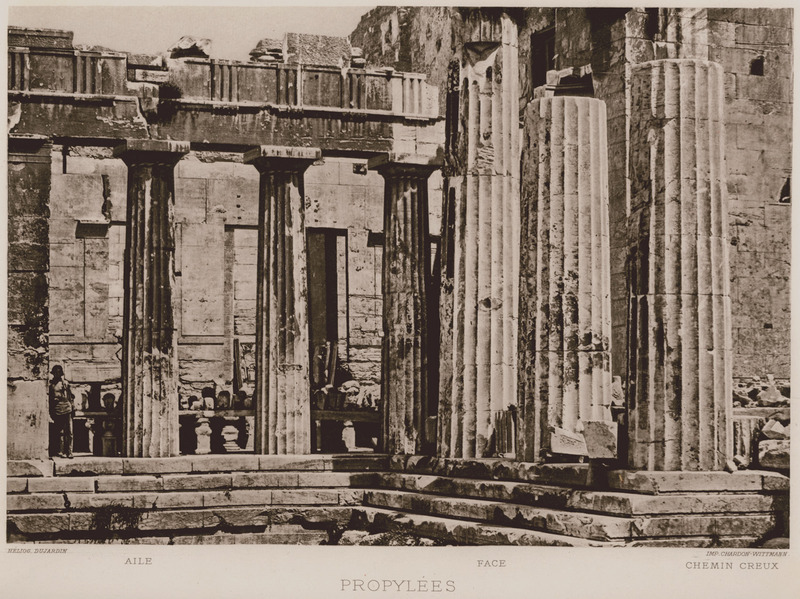 The Propylae of the Acropolos of Athens: Fig. I. 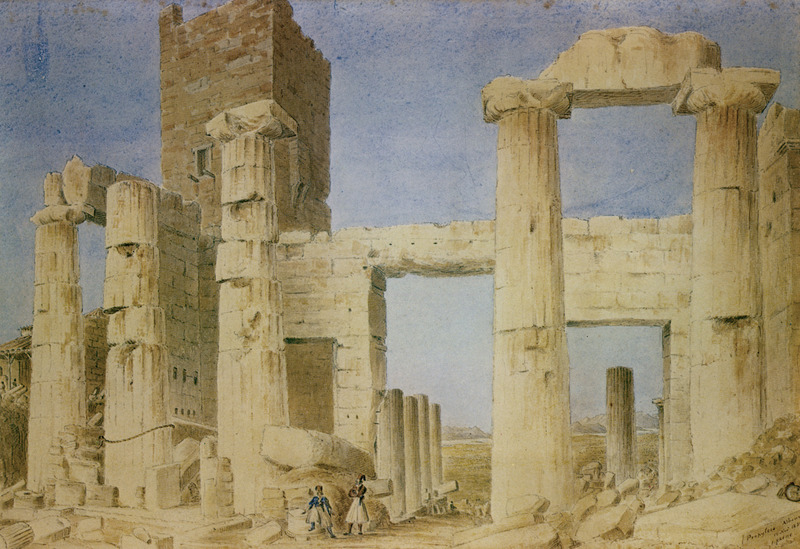 The capital of one of the antae, and the entablature of the Pinacotheca without wings. Fig. II. Profile of ditto. 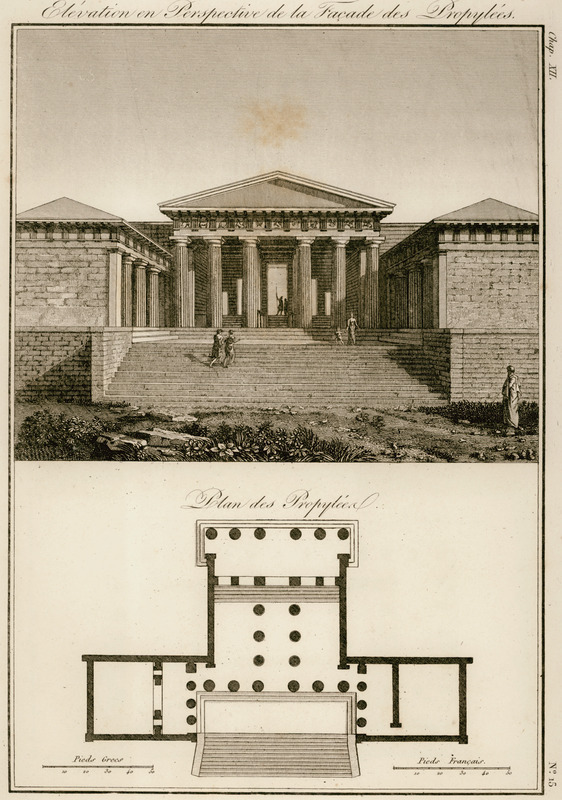 The Pinacotheca at the Propylaea of the Acropolis: Fig. I. Pilasters on each side of the windows within the temple of Victory. Fig. II. 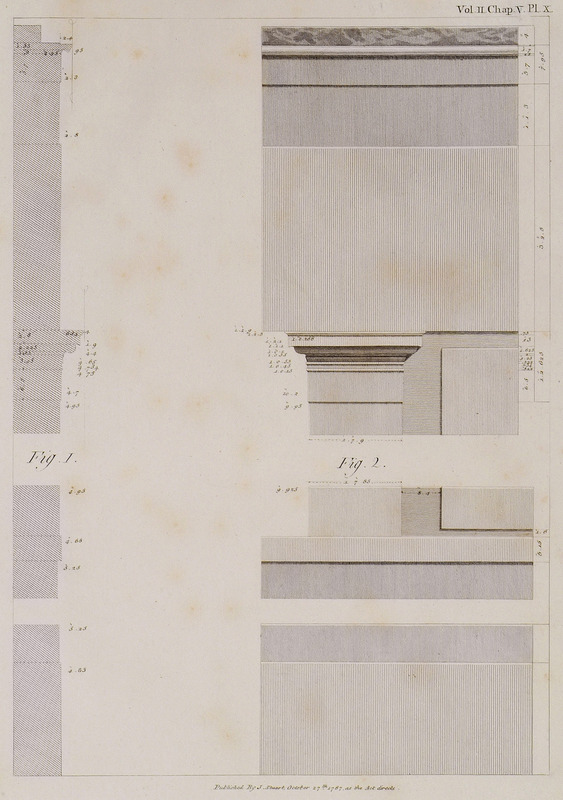 Section of the aforesaid pilasters. Fig. I. Half the capital of the columns belonging to the Pinacotheca at the Propylaea of the Acropolis. Fig. II. 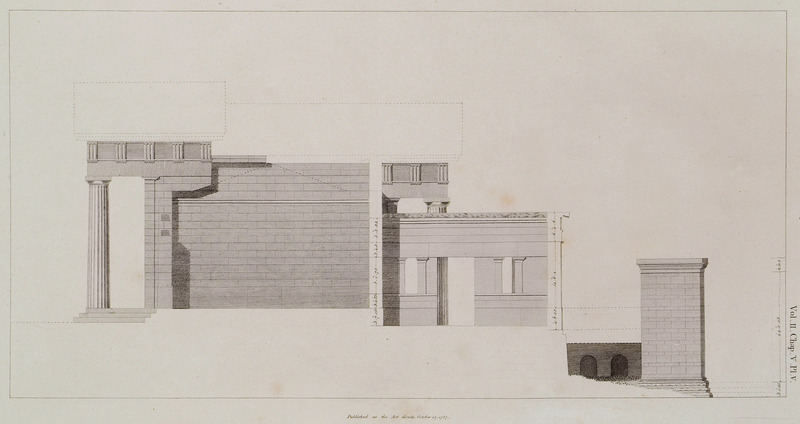 Section of the cornice on the wall connecting the Propylaea with the Pinacotheca, and the temple opposite to it. Fig. III. The capital and base of the pillar inscribed to M. Agrippa, on which stood an equestrian statue. 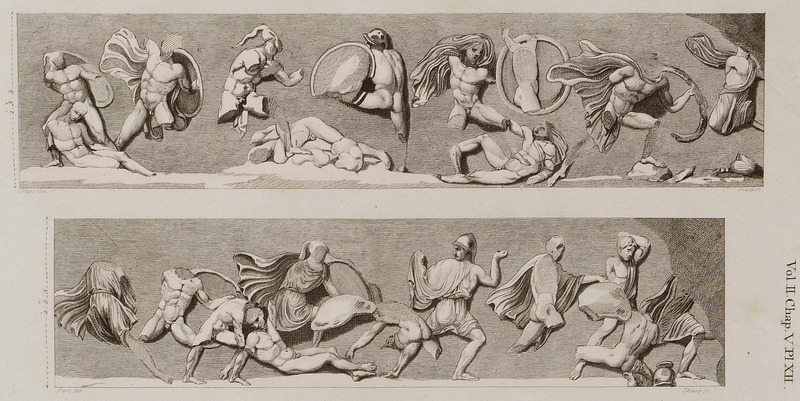 Relief from the frieze of the Temple of Athena Nike, showing a combat between Greeks and Persians.